George Osborne’s autumn statement today signalled additional cuts of some £5 billion from public spending in order to fund a ‘growth plan’ of infrastructure spending and ‘business-friendly’ measures that he claims will kick-start the UK’s economy. The principal ‘savings’ come in the form of welfare & child benefit cuts (by increasing benefits at only 1% a year until 2015, well below inflation) and a further reduction of some 13,500 civil service jobs (on top of the 63,000 axed since 2010 and the 50,000 already planned for the next two years). The benefits measure will take some £4.5 billion from the welfare bill – money taken from the pockets of the unemployed, low earners and families. Among the measures the cuts will fund are £1 billion spending on new roads, and a further cut in corporation tax from the 23% already flagged for 2013/14 (down from 26% last year) to 21% from 2014. Osborne wants us to believe that these measures show that he is “confronting the country’s problems” and will generate growth. But in fact, Osborne has inadvertently provided a perfect illustration of the insane, self-defeating nature of austerity. Let’s look at the £1bn spending on new roads as an easy example. Osborne is cutting £4.5bn from benefits to the unemployed, low earners and families. If he didn’t make the changes he has announced, the £1bn to be spent on roads would still go to those people – and one thing you can pretty much guarantee about the unemployed, low earners and families (the Tories like to make out that all benefits go to ‘scroungers’, but in fact most goes to working people on low incomes) is that they’re going to spend every penny they get. They don’t have much choice – they have to, just in order to survive. £1bn of welfare spending injects about £950 million more or less immediately back into the economy. It’s a rough and ready calculation, but probably not too far off the mark. The £200,000 of profit will be factored down by the company’s accountants to reduce the amount of tax paid on it, and companies are usually paying tax on their profits in arrears, at the end of the tax year at best and often later. But let’s assume that the company pays tax on the full £200,000 at the end of the tax year. At the new rate of 21%, this means that £42,000,000 will go back into the Treasury and can be spent on other things, and let’s be generous and say that all of that goes into the economy via some other route. That still means a loss to the economy of £158 million in profits that will go to private and corporate investors who will sit on the money indefinitely. Not only that, but of the £400 million spent on materials and subcontracted services, the suppliers of those services will take out their own profit margins. Let’s say they also make a 20% profit – that means another £80 million in profits, and only £16.8 million paid in tax – in the best-case scenario. All in all, in our simple, theoretical scenario, the £1 bn spent on roads instead of benefits turns into only £778.8 billion injected quickly into the economy, compared to £950 million if you spent the same amount on benefits for the unemployed, low earners and families. This example is over-simplistic, and deliberately so. Profit margins will vary, the readiness of companies to pay tax and the speed with which they do so will vary, and there will be other factors affecting how much is re-spent, and how quickly, in either scenario. But the principles will still stand, whatever the actual percentages. This basic calculation shows very clearly what George Osborne doesn’t want you to know. Spending on infrastructure will only boost economic growth if it is additional spending. 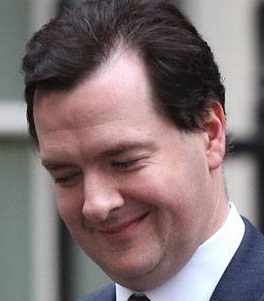 Osborne claims that his measures are intended to be ‘fiscally neutral‘. But in that claim he’s the one being simplistic – he thinks that £1bn spent on roads built by private companies will inject the same amount into the economy as £1bn spent on benefits, so the net effect on government spending will be the same either way. But sucking money out of one part of the economy in order to spend it in on anything in which a profit-margin is taken will inevitably result in less money circulating in the economy, as profits are taken and, in large part, saved or paid in dividends to overseas investors. Since demand is everything when it comes to economic growth, less money going to those who will spend it immediately will suppress growth, not promote it. Since you’re suppressing demand, the very companies Osborne hopes (or claims to hope) will spend more because he’s directing money away from the poorest and into private pockets will end up retrenching, failing to spend and cutting jobs – because there will be less demand for what they offer. That means private workers becoming unemployed, on top of the massive numbers of public employees (including those additional civil servants) – and an increased benefits bill. The vicious circle into which the UK has fallen since the Tory-led coalition took over will spin even faster and even more tightly, and we’ll all be worse off. Osborne claimed today that “[Labour] think by borrowing more, they can borrow less”, but the obvious truth is that if you want economic growth in hard times, government has to be prepared to spend more – but this doesn’t have to mean borrowing more. Osborne is cutting corporation tax because he claims it will promote growth – but in the absence of demand, all it will do is fatten the bank accounts of a very few. And the fact that the rich are getting richer shows that the rich keep most of any extra rather than spending it, so any positive effect on the economy is minimal. If Osborne really wants economic growth – which is questionable, because ‘crisis’ is such a good excuse for all sorts of the ideologically-driven measures that he and his mates love, dear boy – then the secret is to take more from the rich, who don’t spend it, in the form of taxation (whether by higher tax rates, more effective tax enforcement, or both) and give it to the poor who’ll spend it quickly and create demand. Instead, he’s taking at least £4.5bn away from them – and is already flagging the ‘need’ to cut yet another £10bn from the benefits total. It’s basic economic commonsense, as well as being moral. Clearly George Osborne is lacking in both areas, but he’ll get an easy ride tomorrow in the majority of the press – he and they think we’re too stupid to know better.